Aird House is a high quality 4 star, sleeping up to 6 guests in 4 bedrooms. A private garden with stunning views to Mull, Scarba and Jura can be enjoyed while watching the day go by, or the setting of incredible sunsets. A fully equipped kitchen/diner, lounge with wood burning stove, with special touches for a family holiday or a get away from reality. What can I say? One of the most beautiful places we have ever had the pleasure to stay in. From the minute we arrived to a clean, spacious very welcoming Farm House to the gift of fresh eggs laid by the farm hens, the homemade fruit loaf (and the rather lovely bottle of wine!!! ), we truly were in awe of the fantastic views from this gem of a find. It's abit of a journey , tricky to find - but soooo worth it. Looking forward to visiting again in the New Year. Previously a farmhouse the accommodation offers everything you need for a comfortable self-catering holiday for up to six. It was very warm, the kitchen was modern, there was a separate downstairs toilet and all was immaculately clean. The owner and family were very friendly (even bringing the new puppy over for my seven year old granddaughter to see) - and greeted us with wine, eggs and homebaked fruitcake. Could not have been better. What a wonderful place to get away from it all. The house contains everything you could wish for. We had a great time, it was our first visit but I'm sure it will not be our last. A big 'Thank You' to Alison and Malcolm for sharing such a gem. We spent a week in July 2018 at Aird House. The location is spectacular, and my kids (6, 8 and 10) loved it! It is a fairly remote location, not in the absolute sense but relatively. 6 km down a single track road from Ardfern, no other neigbors but the farm, and a view on an uninhabited landscape. My kids liked the animals (cows, sheep, a horse, a cat, geese, chickens etc.) a lot. That, and the sea on your doorstep. My wife and I enjoed the views on Jura and Scarba, the atlantic ocean, and the total peace and quiet. At night there are no lights(!) to see, fairly special in western Europe. The craignish peninsula is nice enough, and a bit further out there is plenty enough to see and do. If you are not a lover of the outdoors- don't bother. If you are this is a very, very nice place to be. Comfortable enough (4 bedrooms !) and practicable as well. The hosts are very nice people indeed - they are there if you need them, and won't bother you at all if you don't. I can empathically recommend this place to a family that wants to spend some time together, away from it all, with nature. Very welcoming. Peaceful quiet place with fantastic views. Very comfortable. Thoroughly enjoyed our stay. Loved being on a working farm. Aird House was a lovely, comfortable and spacious house to stay in with fabulous views. We enjoyed the peace and quiet of the location, seeing the farm animals and other wildlife, and being able to walk in all directions from the house on the suggested walks with route-maps provided. although it was a long drive from Sussex it was totally worth it .the house was warm very clean and the view was fantastic over the loch to the western isles. Alison and Malcolm were informative. the house was well equipped and comfortable. we had wonderful weather and a fantastic time there. would we stay there again we would love too. We have been visiting this cottage for ten years and always have a good time. 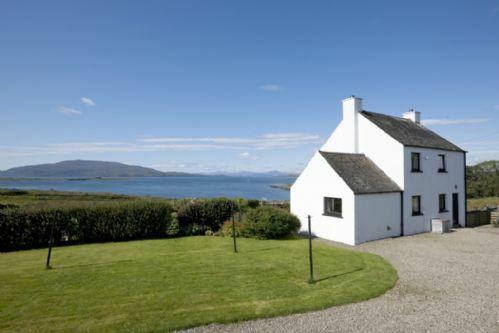 It is very peaceful and has fantastic views over Jura and Scarba, and along to Mull. There are many places to walk in the local area, and plenty of wildlife. It sleeps six very comfortably. We've been many times over the years, and the house gets better every time. The location is stunning, with beautiful views. It's secluded, but not too far from a good pub, grocery shop, and cafe. Just need sensible shoes, and transport for the single-track roads. Aird House is a comfortable, well equipped, warm, spotlessly clean house on a working farm at the end of the single track road which runs downs the Craignish Peninsula from the village of Ardfern in Argyll. It is close to the shore and the ever changing view (depending on the weather) to the islands of Scarba and Jura and the Gulf of Corryvreckan will stay with your long after you have left. Reading the visitor's book you discover that many people return again and again to this property and I would say that it has a lot to do with feeling at home from the moment you arrive. The wine, eggs, flowers and awesome fruit loaf make for a welcoming personal touch from friendly but unobtrusive owners. The stunning views are what you go for . Nothing else matters. There are challenges with the property itself but all worth it for the views......amazing! Wow what a place, from the 4 mile drive off the main road through a lovely village, past yachts and a single track road to the end of the island, there was Aird House in an elevated position with panoramic amazing views. The pictures don't do it justice, the views are breathtaking. The house itself was very warm and comfortable, had everything we needed, it was very clean with no sign of wear and tear, it's obviously meticulously looked after. The owners have their own house who own a working farm on the same land but they are not intrusive at all, in fact we didn't see them at all except on the first day as we drove up the drive and they were moving their cows and the last day when we were packing the car to ensure everything was OK. We couldn't ask for more, the remote location was absolutely perfect with a village shop, pub/restaurant 3.5 miles down the track. We are cyclists and enjoyed the huge amount of sustrans cycle tracks available nearby and island hopping by ferry to the Isle of Mull, we also by pure luck had amazing weather, at the end of September we were lucky to have blue skies and 17 degrees with no rain when we were out and about, of course this added to the delight but this is the UK and if you're holidaying in the UK, you need to bring gear for all weathers. I would highly recommend Aird House, it had everything we were looking for. Comfortable house with a welcome of home-baking, wine and eggs from the hens just over the hedge. No light pollution, tranquil, even the animals all seemed relaxed and the west coast on the doorstep. And sorry to repeat, but that view, straight out to the Corryvrecken, framed by Jura and Mull and all in-between. A family gathering. The weather was almost tropical for four days providing wonderful views and sunsets, then changeable but not unpleasant. Plenty to do with nice walks a good local pub and the locals are very friendly and helpful. Allison and Malcolm are nice and friendly hosts without being intrusive. A comfortable and pleasant holiday. Thank you. Aird Farm has superative views to Jura and Scarba, and is an ideal location for rest and relaxation. There are walks from the door, and the village shop at Ardfern, 5 mins drive away, is very well stocked with a mix of luxury and basic items. Plenty to do in the area, but does involve a fair bit of car travel if exploring. Aird House itself is clean and vey well equipped. Washing-up liquid, dishwasher tabs, etc. are provided, and a welcoming cake and bottle of wine, as well as fresh flowers show the owners' thoughtfulness. Owners are on-site, are there if you need anything and hapy to have a chat about the farm, area, or anything in general, but leave you to get on with your holiday as you wish. Wi-fi is very slow and a connection a bit intermittent - but given the location is amazing it is there at all, and the whole point of a holiday here is really to get away from connections! Highly recommended. Excellent accommodation with what must be one of the best views of the West coast! House very comfy and homely. Has everything you require and the hosts are always on hand if need anything! If you want to get away from the stresses of everyday life, this is the place to head to, can't fault it one bit and we keep going back year after year! We stayed mid may for the second time, had a fabulous holiday, house has everything we required plus that view is spectacular. Wildlife is all around, from the kitchen window we had a treat of one and a hours watching dolphins and otters. The peace and solitude is very relaxing . Malcolm and Alison very pleasant hosts. The eggs left for us had proper yellow yolks, the wine and cake were nice touches. The house is very clean and tidy, comfortable beds, bed linen crisp and fresh, all in all cannot fault our stay at Aird.